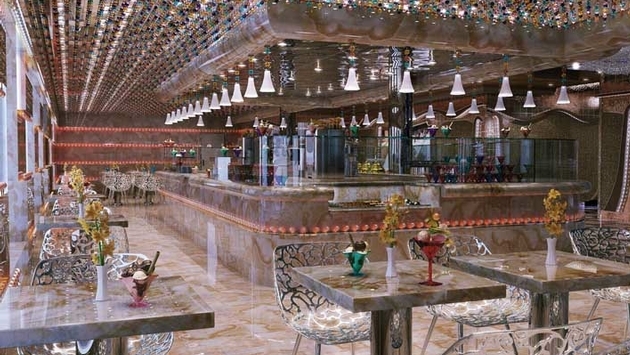 PHOTO: A look at the Gelateria Amarillo aboard the soon-to-be-christened Costa Diadema. Costa Cruises introduces the rich gastronomic offer onboard the new flagship, Costa Diadema, which will let guests live the total mood of an Italian holiday, tasting authentic traditional dishes and enjoying the relaxed lifestyle of "La Dolce Vita." The "Regina del Mediterraneo" will be the ambassador of Italy's finest in the Mediterranean Sea and will delight her guests with the most diverse culinary selection, where Italian dishes and products are the "queen" of the offer. Thanks to the different dining venues onboard, directly overlooking the sea, guests will feel the atmosphere of a buzzing Italian seaside resort, enjoying the pleasure of some relaxed time, like in the tradition of the best Italian holidays. Onboard Costa Diadema there will be plenty of occasions to taste excellent food: some of the opportunities include a Barilla pasta lunch, a coffee break anytime with Illy Caffé and a wine tasting with a variety of labels for every palate, such as Ferrari sparkling wines, which created also a special label for the upcoming Diadema christening of on Nov. 7, 2014. Costa corporate executive chefs, like the starred chef Fabio Cucchelli, created Italian menus from the best regional traditions, to be tasted at various restaurants during their days of relaxation onboard. The perfect place to live the special atmosphere of Costa Diadema is the open-air Promenade, a real Italian "Terrazza," which goes around the ship from stern to bow on deck 5. Here, guests can go for a stroll, or, even better, relax in one of the several bars and restaurants with outside cabañas, which are extensions of the internal dining venues. On this wonderful promenade deck, guests can have a glass of more than 80 first-rate wines from over 50 Italian wineries through the collaboration with AIS, the Italian Sommeliers Association. Some of the most popular are Frescobaldi, Antinori, Cusumano, Fontanafredda, Batasiolo, Jerman, Felluga, Pasqua and Planeta, which can be tasted in the cozy atmosphere of "Vinoteca Gran Duca di Toscana" (wine bar). The authentic Italian "aperitivo" can be tasted at the several bars onboard, with differentiated specialties to drink with friends in a lively atmosphere — a savory tradition of the Italian lifestyle to enjoy, right before dinner, in the total comfort of Costa Diadema! At the Bar Bollicine, the offerings include a wide selection of DOCG Superior Prosecco, "Spumante" sparkling wine, Champagne and different types of Prosecco-based cocktails as the well-known "Spritz," made with the classic Italian Aperol or the more peculiar Campari. Guests will feel like they're strolling along an Italian lido at the beautiful Bar Teodora at the stern. While admiring the gorgeous view at the sea, they can choose from a great selection of cocktails for their personal version of the "aperitivo." For those that opt for the "Vinoteca Gran Duca di Toscana," they will live a tasting experience of top-quality Italian wines, accompanied by a selection of Italian high-end cheese and salami to appreciate the different flavors: an "aperitivo" for connoisseurs! When dinner time approaches, guests eating at the Pizzeria will be amazed by the 100 percent Italian pizza, available in 14 flavors. Furthermore, the pizza is baked by Italian "pizzaioli," including those who graduated from the renowned "Accademia Italiana della Pizza." For those who want to experience exotic gastronomy, the fusion cuisine of the Teppanyaki Restaurant welcomes every guest in the elegant setting of an Oriental-style lounge-restaurant. Here the chef will cook on the iron plate – the typical Japanese "teppan" — right in front of the guests, who will sit around the counter in a friendly and lively atmosphere. The expert chef will amaze everyone with a real show cooking, which involves food preparation and incredible acrobatics. Children and parents will enjoy six different crepes, as well as 18 flavors of homemade ice cream of the Italian tradition prepared with Agrimontana high quality ingredients at the Gelateria Amarillo. Costa Diadema's Gelateria also offers excellent sweets and pastry making: the most gourmand guests will have the chance to appreciate top-quality chocolates and pralines of the Italian maître chocolatier, Guido Gobino, as well as the "macarons" of the maître pâtissier chocolatier Luigi Biasetto. During a break in the afternoon with the whole family at the Gelateria, everyone can also enjoy the typical tiramisu, "babà", "sfogliatelle," 3 types of chocolate cakes and three other specialties from the various Italian regions: an absolute expression of Italy's finest! The Dresden Green Pub will be available for a glass of good beer. Here, in the mood of a Bavarian beer garden, guests can choose from the many tastes of beer available, from the traditional "bionda" (pale ale beer) to the most peculiar ones, like the double malt and the "red." The selection is made up of bottled beers by the most prestigious Italian and foreign brands along with a range of different draught beers, including homemade types from Italian breweries. Meanwhile on deck 4, the Grand Bar Orlov will take guests back to the charming atmosphere of the '50s, also appreciating music and dance performances on the central stage. At the restaurants of the flagship — the "a la carte" Club Restaurant, the Fiorentino Restaurant, the Adularia Restaurant and the Corona Blu Restaurant -— guests can taste traditional menus in which the Italian pasta is a milestone and the quality is guaranteed by Barilla, one of the oldest and worldwide-appreciated Italian brands. In particular, the wide array of offering of the Corona Blu Restaurant is served in different areas during the day, from the salads area to the "Focacceria," "Lo Spiedo" rotisserie, grill and many other peculiar corners, with specialties of the visited destinations. In the evening, the buffet turns into a refined restaurant with table service. For the most demanding guests, who are particularly into healthy lifestyle, Costa Diadema offers light and tasty menus at the Samsara Restaurant: especially after spending a relaxing day at the Samsara Spa for a total remise en forme, guests can enjoy some wholesome dishes for the wellness of body and soul. This special restaurant is available to all guests staying in Samsara cabins and suites and, upon request, to all Guests of the ship. At every restaurant of the "Regina del Mediterraneo," Costa experts have chosen the most suitable Italian wines to match each course: a perfect "food-matching-wine" program. The new flagship's kitchen staff consist of 212 people directed by an executive chef, five sous chefs, 15 chefs de partie and 5 Tepannyaki chefs. All chefs on the fleet are specifically trained before boarding a Costa ship. The training workshops, which simulate activity on board with theory and practice sessions, is provided in the "Costa Campus" centres, the company's own training schools, or by specific courses run in association with Italian local authorities. Costa employs 27 executive chefs in total, 18 of whom are Italian.